Spanning over 7,000-acres along La Romana’s coast, Casa de Campo puts sophistication into beachside living. 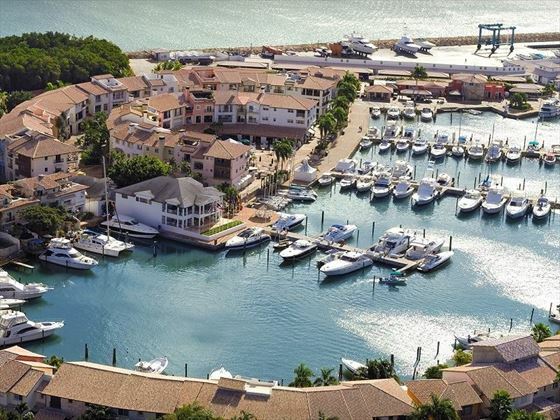 With stylish indoor and outdoor living spaces, its own private marina and secluded Minitas Beach, we love that this resort feels like an exclusive and luxurious village. 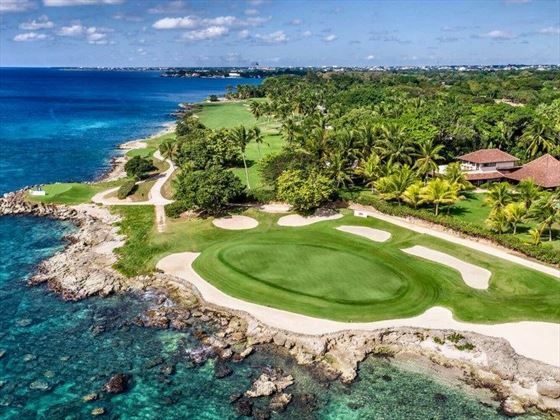 Many celebrities come here for a tranquil escape, turning Casa de Campo into an even more desirable getaway. You’ll soon realise why this luxury resort is such a hit – it’s home to the number one golf course in the Caribbean, Teeth of the Dog, as well as a number of divine restaurants and bars. We love the contemporary Minitas Beach Club & Restaurant, an elegant space that combines decadent Mediterranean cuisine with a peaceful pool deck and ocean-view bar, whilst no holiday is complete without a signature Pina Colada at Coco Mar, served in a fresh Dominican pineapple. The rooms and suites here are elegant and modern, adding a subtle touch of authentic island style alongside luxury amenities – including your very own complimentary golf cart to help you get around the expansive grounds. The incredible villas are certainly the star of the show though, all with their own private pool and spacious living and dining areas. It’s not just the beautiful exterior and interiors that make us love these villas so much, it’s the amenities, too. Who wouldn’t enjoy having breakfast made for you each morning in the comfort of your villa? 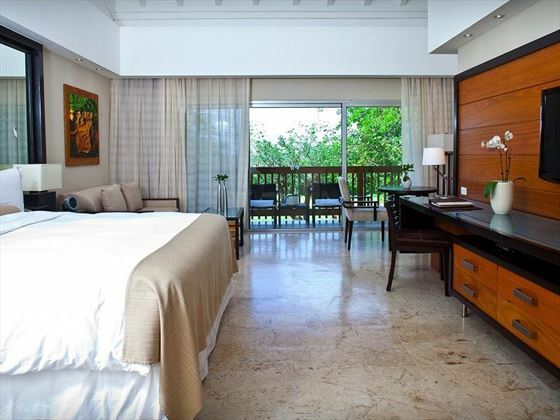 Though Casa de Campo focuses on evoking a classy and trendy ambience, the resort is also brilliant for families. Complimentary non-motorised water sports, treasure hunting, beach Olympics, horse riding…every day is filled with a myriad of possibilities, and there’s even a cool hideout for teenagers, too. This picturesque oasis also offers a fabulous All-Inclusive experience, including an extensive menu of food and drink at the signature restaurants, as well as unlimited horse riding and family-friendly activities. 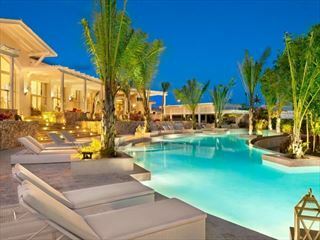 This chic resort is located in La Romana, a city that sits along the Dominican Republic coast. With 7,000-acres of lush gardens, sugary coastline and pristine golf courses, you’ll feel like you’ve found a little slice of paradise. Superior Casitas – fully renovated, these rooms feature elegant modern designs combined with touches of the historic character of the city. Deluxe balcony – these rooms have been renovated to the highest standard featuring large bathrooms with walk in showers and spacious outdoor areas surrounded by beautiful tropical greenery. 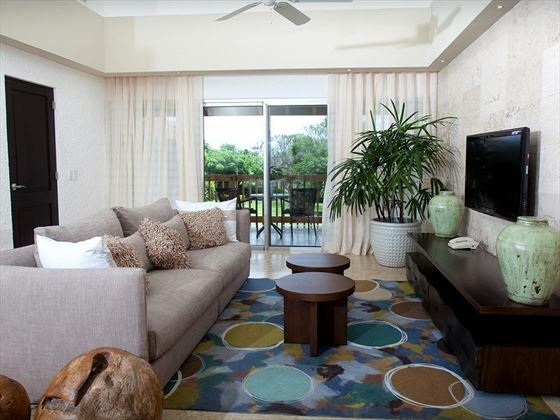 Elite Patio Room – Quiet and calming first-level rooms, featuring contemporary décor and the standard amenities. Elite Balcony Room – Elegant second-floor rooms with cathedral ceilings and sliding glass doors that open out onto the private balcony. Elite Deluxe Room – These rooms are great for families, featuring a sofa bed, and a private terrace looking out onto the gardens. One Bedroom Suite – Spacious suites featuring a separate living area, a dining table for six, two balconies, chic interiors, and one king bed. 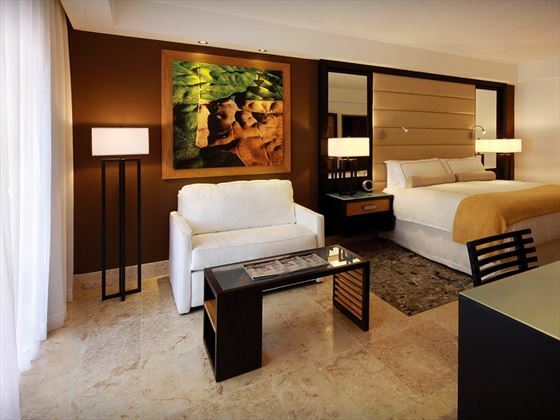 Two Bedroom Suite – With the same amenities as the one-bedroom suite, with an added king size bed or two double beds. 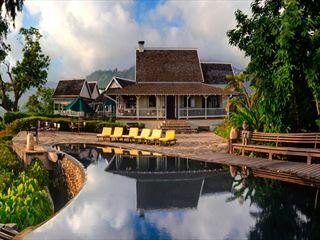 Garden Villa – These villas are hidden amongst the tropical flora, offering stunning views of the well-kept gardens. Featuring a private pool, two golf carts, daily breakfast prepared in the villa, private maid service from 7am-4pm, personalised check-in, and free WiFi. These villas come in three or four-bedroom configurations. Classic Villa – Lovely colonial style villas, boasting a private pool, a kitchen where breakfast is prepared daily by professional cooks, private concierge service, personal maid and butler service from 7am-7pm, free WiFi, and personalised check-in. Featuring three – five bedrooms. Three and four-bedroom villas benefit from two golf carts, whilst those with five bedrooms have three golf carts. 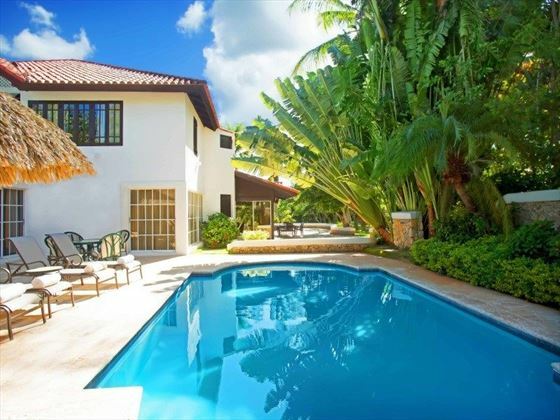 Oceanfront Villa – Located right by the beach, these villas are gorgeous and inviting. You’ll benefit from maid service 7am-9pm and butler service 7am-7pm, as well as breakfast prepared in your kitchen each day. The villas also feature a private pool, access to group exercise classes, personalised check-in, concierge service, and four to 10 bedrooms. Those with five to 10 bedrooms also have three golf carts and one intermediate size car, whilst those with four bedrooms have two golf carts. Minitas Beach Club & Restaurant – This restaurant concept is contemporary and luxurious, offering wonderful al fresco dining alongside a deck with an infinity pool, an ocean-view bar, and a lounge area. Perched on Minitas Beach, the menu here fuses Mediterranean and Latin American cuisine, including delicious ‘family style’ dishes ideal for sharing. La Cana – A modern space offering tasty light lunches and gourmet Mediterranean dinners. Open 12pm-4pm, and 6pm-11pm, with snacks offered from 12pm-6pm. Reservations are recommended, and collared shirts and long trousers are required. La Piazzetta – This stone-walled restaurant feels authentically Italian, creating a romantic ambience with its views of Altos de Chavon. Dine on handmade pastas and antipasto with a loved one for an idyllic experience. Open Monday-Sunday 12pm-3pm and 6pm-11pm. Lunch at the restaurant is seasonal only. Reservations are recommended, and collared shirts and long trousers are required. Lago Restaurant – Treat yourself to a classic Dominican feast at this utterly charming buffet restaurant, where food is freshly handmade with a lot of love. Dine on the likes of empanadas, fried chicken and Dominican stew whilst looking out onto the 18th hole of Teeth of the Dog. Open 7am-11am, 12pm-3pm, and 6pm-10.30pm. Dinner is seasonal only. Reservations are not required, and the dress code is casual. 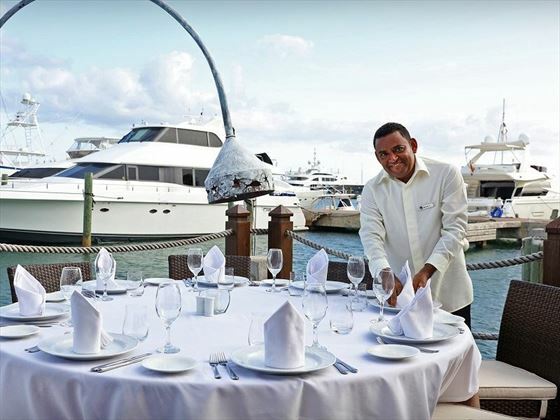 La Casita – Located in the marina, it’ll come as no surprise that this gorgeous al fresco restaurant offers the most sumptuous of seafood. Nothing feels more luxurious than dining on paella in the open fresh air as the sun sinks beneath the horizon. Open Tuesday-Sunday 6pm-11pm. We recommending reserving in advance, and the dress code is causal elegance. Pubbelly Sushi – Take yourself on a journey through Asia with this fun neighbourhood-style restaurant, offering a unique menu including spicy tuna taquitos, rockshrimp tempura, and chicken yakitori. Open 12pm-3pm and 6pm-11pm. Reservations are recommended, and there is a casual elegant dress code. SBG – Elegant and sophisticated, this pretty restaurant serves up decadent Mediterranean and fusion cuisine. Outdoor seating is right by the pool, and there’s also the occasional live band or DJ. Open 12pm-5pm and 6pm-11pm. It’s recommended to book in advance, and there is a casual elegant dress code. Coco Mar – A cool, traditional beach bar right by the ocean. You can create your own custom cocktail, but we believe you can’t go without one of the signature pina colada’s, served in a local Dominican pineapple. Open 10am-6pm. No reservations needed. The 19th Hole – A chic bar on the Teeth of Dog golf course, boasting a build-your-own-sandwich bar – perfect for a quick lunch. Open 9am-5pm, with food served 11am-5pm. La Terraza Bar – Found above the Tennis Centre, this café and bar is nice and casual, with a swimming pool just behind the main seating area. Open 8am-7pm. 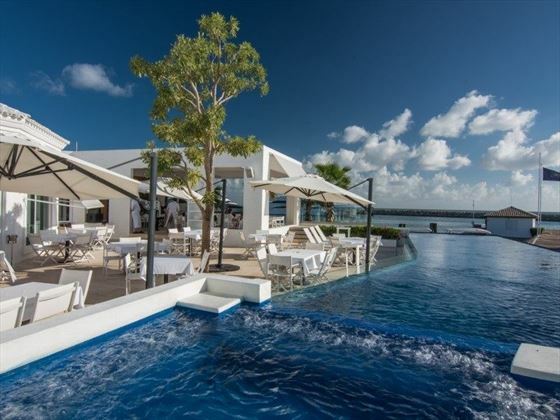 La Cana Bar & Lounge – Open day and night, this is an easy spot to grab a refreshing drink, and once the sun goes down this becomes a fun venue with live music and dancing. Open 9am-1am. Dye Fore Bar – Overlooking the Dye Fore golf course, this is the perfect refresher after a game of golf. Featuring a romantic balcony and pool. Open 9am-5pm, with light lunches served 12pm-3pm. 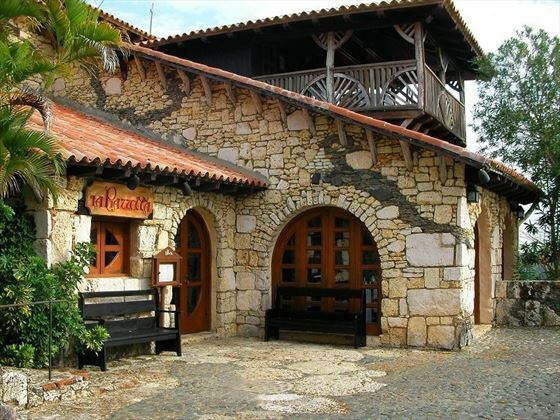 Genesis Nightclub – A vibrant and exciting nightclub located in Altos de Chavon – a replica of a Mediterranean village in the 16th century. Opens 10pm Thursday-Sunday. No shorts, swimsuits, hats or sleeveless shirts allowed. Toddlers ‘n’ Casa – A programme for kids aged 1-3, your little ones will be supervised as they enjoy fun-filled half or full day itineraries including arts and crafts, puppet shows, fun in the playground, and musical games. Open 8am-5pm. Kidz ‘n’ Casa – An exciting programme from children aged 4-7, with fun activities including swimming, pony rides, beach Olympics, and treasure hunts. Open 8am-5pm. Casa Tweens – Designed for children aged 8-12, this half or full day programme offers adrenaline fuelled activities, including horseback riding, kayaking and tennis. Open 8am-5pm. Bonche 4 Teens – A cool area exclusively for teenagers aged 13-17, offering teen-only activities including billiards tournaments, parties, air hockey and movies. Teens will need a Casa de Camp Hotel Guest Card to enter. Open 8am-6pm. Family Fun Zone – A colourful centre full of family-friendly activities and games. Nannies are available day and night for an additional price. Available from 8am-12am. 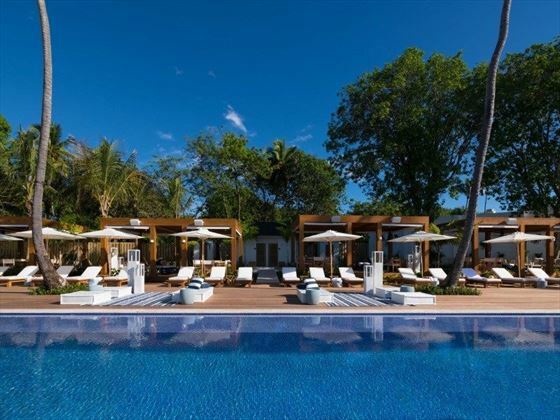 Casa de Campo’s All-Inclusive offer is the ideal way to ensure your holiday is stress-free and simple. Modern and stylish, Eden Roc at Cap Cana offers an unforgettable beachside holiday at one of the Dominican Republic's most impressive resorts. Strawberry Hill is a former coffee farm, perched 3,100 feet above sea level in the beautiful Blue Mountains. 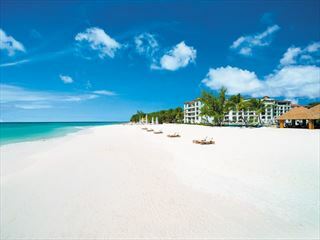 A unique boutique resort offering an enchanting mix of rich Jamaican heritage and healthy conscious living. Strawberry Hill is only 30-minutes from the airport. This vibrant all-inclusive Resort will add even more style and colour to the lively St Lawrence Gap. With minimalist decor, scenic balconies, romantic restaurants, holistic spa treatments and decadent bars, you'll feel like royalty here.